I literally took hours to insulate my windows with bubble wrap when I did it for the first time. 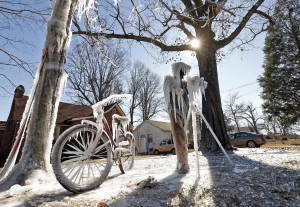 Do you know how long it took for insulating windows the next time? Today I'm going to show you how you can drastically improve energy efficiency (on a zero budget!) by installing bubble wrap insulation on single glazed windows. Is Bubble Wrap Good for Windows Insulation? Windows provide our homes with warmth and light, but they can also be a major weak spot in your home’s thermal efficiency profile. 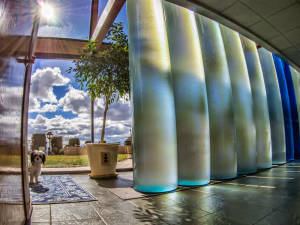 Homes with single glazed windows, especially in cold climates, would experience full effect of this simple heat loss prevention technique. By applying ordinary bubble-wrap packing material on your windows to keep the heat in, it is possible to cut down utility bills almost in half. Up to 50% of heat loss can be saved by insulating single glazed windows with bubble wrap. It is quite easy and fun to install, literally few minutes per window is enough. Even for double glazed windows bubble wrap insulation does have some effect - up to 20% improvement in heat loss. However, using this technique on triple glazed windows does not bring any measurable improvement. Main reason for using packaging material instead of commercially available insulators is that it is abundant. Where to Get Bubble Wrap? People throw out bubble-wrap every day, and any modern product packaging is unthinkable without it. You can find it in almost any products package, which is excellent thing because reusing and recycling is a good cause as well. Wrapping material with less space between bubbles is generally performing better as it holds more heat. So if you want maximum performance, try to find and select pieces of bubble wrap with bigger bubbles. 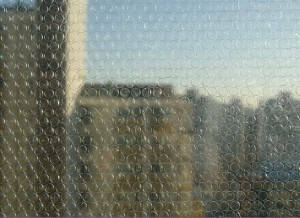 Bubble Wrap Insulation on Windows - Does it Work? We have tested the bubble wrap insulation on north facing, single glazed windows in order to see if it would prove to be a good insulation. Bubble wrap insulation actually works great! It also increased the R value (resistance to heat flow) of our windows by factor of 1. The only downside effect is that the view through the insulated window is a little bit fuzzy, however it does let plenty of sunlight in. Guys from BuilditSolar tested bubble wrap insulation performance, and they were amazed with the results, also with simplicity and short payback period. Can be removed easily after the heating season, just peel it off from one corner and save till next year. And last but not least, it does not leave stains and there’s no sticky scotch tape leftovers on glass. How Good of an Insulator is Bubble Wrap? Bubble wrap is a very good insulator thanks to small pockets of air trapped within the bubbles. After applying bubble wrap insulation onto your window pane from the inside, small bubbles serve as a network of many insulating pockets filled with air. During the winter, bubble wrap can effectively protect your home or greenhouse against the cold penetrating inside and prevent heat from moving out. After installing the bubbly window insulator, you can sit back, relax and enjoy artistic fuzzy view of the outside world and watch how your electricity bill goes down. Don't forget to reuse the same bubble wrap sheets next year, simply peel them of easily after heating season is over. Just to mention that this is not the best possible window insulation, but it is very cheap, fun and easy to try. We encourage you to use it in your home and you will certainly be amazed with the result.